I was reading a letter to Tramore Town Council, about the new Guillamenes cattle-crush, from someone who’d been involved in International Water Safety for many years. In the letter the person pointed out how someone had been “swept off the diving platform by a freak wave”. I said the Club Secretary Aidan Farrally that his points were valid but subsequent to that assertion, his arguments became suspect. Now despite my deliberately somewhat provocative title, yes there are such things as freak waves. However while they are long reported, they are an only recently confirmed open ocean phenomenon, and more commonly known as rogue waves, (twice the height of the significant wave height around them). But here we are discussing so-called freak waves at the coast, the interface of land and sea. Every year we read or hear stories of coastal drownings caused by freak waves, where people at the coast are caught by a wave seemingly out of scale or size to the preceding waves, and swept off rocks, out to sea or suffering a fatal concussion from rocks. These are tragedies, but I have long had a problem with this reporting because it perpetuates a myth about the sea, and somewhat shifts the responsibility of care away from the person into a force-majeure situation, an “act of god“. If there are freak waves, how can an average person realistically protect themselves except to stay away from the coast? If there aren’t freak waves, then the responsibility shifts to people themselves to be more vigilant. The phrase freak wave implies that what has happened is unusual and unforeseen, neither of which are the case. Ask any surfer. So we need once again to talk about waves and safety at the coast. Most waves are caused by wind. Wind blows over the water surface and the friction pushes the water. The distance of water over which the wind blows is called the fetch, and the longer the fetch, and the longer the time and stronger the wind that blows, the bigger the initial waves. If the wind continues to blow, as the waves grow, they present even more surface for the wind to push. The waves continue to grow. Waves are an energy pulse that travels through the water and will continue to travel unless something stops them. That something from our point of view, is land. I said initial waves above, and that’s really important. Wind that blows in a Western Atlantic storm cause waves, which if unimpeded by other contrary weather, may blow those winds toward Ireland and Europe, across 2000 miles of open water. We need to think about the fundamentals of a wave. Imagine the wind blowing and causing waves. The height of a wave is called the amplitude. The greater the amplitude the more energy in the wave. The number of waves in a particular time is called the frequency. Waves of different amplitudes usually have different frequencies. The higher the amplitude or height, the lower the frequency. The bigger the wave, the longer the time between them and the less frequently they appear. Waves travel at different speeds. Wind that cause waves nearby can have lots and lots of chop, small waves really close to each other. Now the critical things about waves of any kind, not just water, is if they are even fractionally different heights they will travel at different speeds. What happens if two things, in case waves, are travelling the same direction at different speeds? The faster one will pass the slower one. 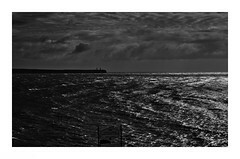 The further away the initial wind, the further the waves will travel. If a faster waves catches a slower one, the basic physics means that they will be added together. The amplitude, the height of the waves, will become the two combined heights. A one and half metre wave catching a one metre wave, will become a two and half metre wave. This wave, in surfer’s parlance, is called a Set Wave. Surfers don’t see them as freaks, but as normal aspects of the ocean’s behaviour. This doesn’t happen quickly but when you have hundred or thousands of miles or kilometres in which it can happen, it doesn’t have to be quick. The result is that you have a wave that is now a third higher than the higher of the two previous waves. And that may be higher than all the surrounding waves. And the bigger it is the faster it’s travelling but the longer time between them, so there can up to many minutes between large waves like this. Any experienced surfer can tell you that the period between the largest set waves could be up to 15 minutes. Now we’ve explored the formation and irregularity of waves, we’ve seen that these are not freak waves, but normal ocean behaviour. The important thing becomes that the responsibility for understanding this lies with the person on the shore, just as it lies with a pedestrian crossing a road, except the ocean can’t see or react to you like a motorist can even when you are in the wrong. Therefore the most important action to watch the water. Always. This is NOT expect the unexpected. This is how the ocean works. 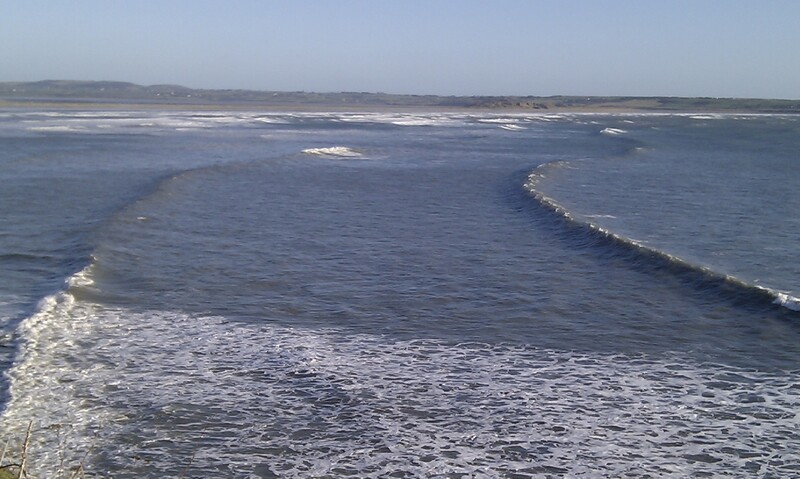 A wave seems to appear out of the flat surrounding sea at Tramore. Easy to see on a beach, not so easy to see elsewhere. Watch the water for twice as long as the waves are high (in imperial measurement). If the waves look to be two feet high, watch the water for four minutes before venturing close to the shore. If the waves are two metres high on initial appraisal, you should (approximately) convert that to feet, and watch the water for six to seven minutes before getting close. Do this regularly and you will start to gain a better appreciation for the sea and its rhythms. And more importantly, you and the people around you will be safer. Coastal safety is your responsibility! Very well done. I applaud you for pointing out two things. First, the ocean is a complex collection of waves which either add together to create larger waves or cancel each other to make smaller waves. Although you only discussed the larger set waves, the big “cleanout” waves a commenter referred to are also possible. In fact, there is a continuum of waves in the typical chaotic sea state, which are rarer and rarer as the size gets larger and larger. Second, I do like your rule of thumb, which is to watch the ocean for twice as many minutes as the wave height in feet. I know that before I go out, I sit on shore and watch. And I know that the bigger the waves the longer I watch … I just never thought of it that way before. As a long time surfer just browsing your site I can say your explanation is often on point but I’d like to clarify about the potential irregularities between sets and have your opinion on the matter. I’ll say from personal experience there are every so often waves that definitely exceed the average set height by a large margin. Often might be referred to as a clean up set, because the entire line up is used to sitting in one spot when suddenly a larger set pops up too far away for everyone to paddle and make it over. The line up is washed away or cleaned up. The interesting thing is how little we seem to know about predicting when these larger sets might occur, and even predicting which particular wave in the larger set will be the biggest. A typical set is much easier to predict, especially on longer period swells where the waves have had the chance to line up nicely. This can be accomplished by sitting and watching, as you’ve properly suggested. On the other hand the larger sets can be very unpredictable. They might show up every 30 minutes or every 120 minutes. This might be in the span of several average sets time. Sometimes it becomes easy to forget you haven’t seen one of these larger waves in awhile and you let down your guard. An average person might easily be surprised when a regular set rolls through, never mind an unpredictable larger set that might even startle seasoned water folk. I agree in this sense they are not freak waves at all! Not to mention the waves may pick up prior to a storms arrival on land, misleading those who believe it’s a typical sunny day. Hey Gary, I don’t disagree with any of what you say. You reinforce that the sea is a complex and unpredictable system, and being safe around it is an individual responsibility. By always ascribing coastal accidents to “freak waves” as the media does so often, we lessen the message of individual responsibility for coastal visitors. It’s rarely surfers or open water swimmers who are caught by this change, as they at least understand there are such unpredictable events as clean up sets and are at least prepared or already in the water. Thanks for dropping by and commenting. Hey I appreciate your response it’s very true. Thank you for writing, I’ve been browsing your site to learn about swimming and it has been helpful! Thanks for a most informative post. So here in Oregon, USA there is definitely the unpredictably large occasional wave that wreaks havoc. I’ve been personally acquainted with two people who were swept off the beach by such waves. While these waves are most certainly the result of normal ocean behavior with the addition of waves building into larger waves they could still be described as freak waves because they are not part of a set pattern. The one individual for whom things turned out OK described it as seeing a wave coming in that looked like she would need to move up the beach to avoid getting wet feet. It was not until the the wake rose and broke at the shore that it became apparent that she was in deeper trouble. Fortunately both she the friend who was with her were able to get themselves back to shore in very cold water and were fine. The other individual suffered brain damage to the point of being in a semi-vegetative state. Yes it is extremely important to watch the ocean in order to stay safe but sometimes if the ocean wants you it is going to take you and there’s very little you can do about it. >there’s very little you can do about it. I’m not being trite, but the obvious solution there is staying far enough away. The tendency to blame the ocean takes the responsibility away from people to understand it and act safely. Waves can be unpredictable, but that doesn’t make them freaks. That’s partially the point. I was once on Crab Island, on Ireland’s west coast, a tiny island that sits just offshore, in the eye of some the huge spring & autumn westerly swells and a surf location of frightening power and technical intensity. We were unable to make it through the channel, so we paddled to the back of the island to walk across. As we walked over the reefs a “bluebird” as the Hawaiians called them, washed across the reef. I was rag-dolled across the reef, the board broke, and I was slammed into the reef on my head. I walked away from it, because I was wearing a surf helmet. 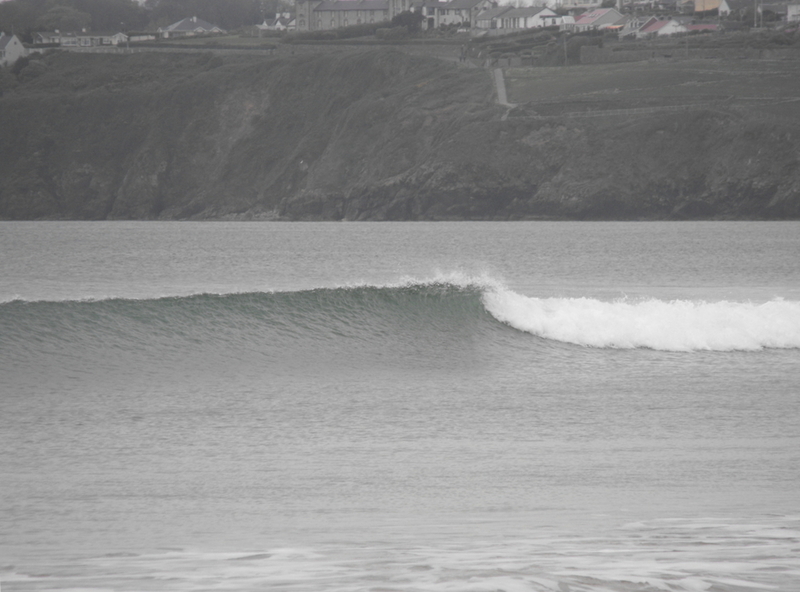 The wave was exceptional to the size of those around it, but still understandable. I also didn’t emphasis, in an effort to keep it simple, that the larger waves as they grow in amplitude, also grow in speed. The effect of this is that it’s possible for the largest fastest waves of an incoming groundswell pattern, to be the first waves to arrive, especially when they’ve travelled a longer distance, as happens more in the Pacific with its greater distances, than in the Atlantic. Very interesting post, Donal. Despite our self-portrayal as an island people with an inherent knowledge of the sea, Irish people generally act with a surprising amount of stupidity when it comes to coastal activities. One anecdote: my grandfather was once drenched, much to the amusement of my mother and uncles, when one of these waves came crashing over the pier wall in Ballycotton many years ago. It was an otherwise calm-ish day and it really caught everyone off guard. No-one was hurt but everyone got soaked!